Lori Steffens is an honors student at the University of Iowa seeking a B.F.A. in Photography and going into her Senior year. She specializes in creating abstract art out of everyday objects, from soap bubbles to cereal and also enjoys taking pictures of the Iowa countryside. She currently works at the University of Iowa Hospitals and Clinics and June Lily Photography, a portrait studio, where she is the owner/photographer. One of the most interesting things about being an artist is being able to find the unusual in the everyday aspects of life. It is this theory that drives Lori to create the work that she does. Experimenting with textures and everyday items, and modifying them, she is able to bring out patterns and new textures that in no way resemble the items that they began as. 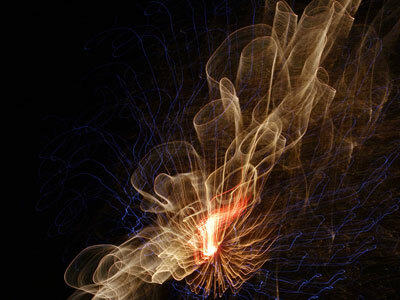 The images from this series, "Light Show" are all taken with delayed shutter speeds and capture fireworks as no human eye could ever view them, creating intricate patterns and designs unique to each photograph.